Hyperinflation is extremely fast or out-of-control inflation. Hyperinflation occurs when price increases are so wild that the concept of inflation is meaningless. Although hyperinflation is considered to be rare, it occurred as many as 55 times in the 20th century in countries such as China, Germany, Russia, Hungary and Argentina. When associated with depressions, hyperinflation often occurs while there is a significant increase in the money supply not supported by gross domestic product (GDP) growth, resulting in an imbalance in the supply and demand for the money. Left unchecked, this causes prices to increase, as the currency loses its value. When associated with wars, hyperinflation often occurs when there is a loss of confidence in a currency’s ability to maintain its value in the aftermath. Because of this, sellers demand a risk premium to accept the currency; they do this by raising their prices. Within a short period of time, the average price level can increase exponentially, resulting in hyperinflation. Hyperinflation is a macro-economic event that occurs as a result of a steep devaluation of a country’s currency that causes its citizens to lose confidence in it. When the currency is perceived as having little or no value, people begin to hoard commodities and goods that have value. As prices begin to rise, basic goods — such as food and fuel — become scarce, sending prices in an upward spiral. In response, the government is forced to print even more money to try to stabilize prices and provide liquidity, which only exacerbates the problem. 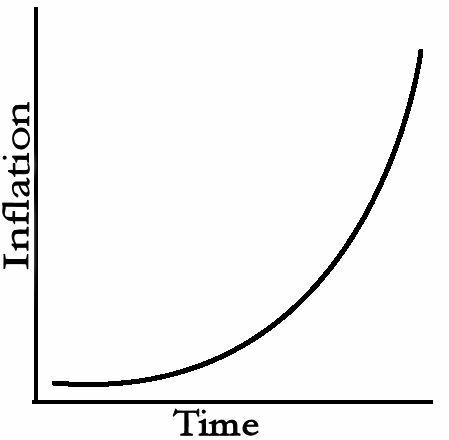 Whereas normal inflation is measured in terms of monthly price increases, hyperinflation is measured in terms of exponential daily increases that can approach 5 to 10% a day. Hyperinflation occurs when the inflation rate exceeds 50% for a period of a month. There are a number of pitfalls to hyperinflation. People will tend to hoard goods — including perishables like food — because of rising prices, which in turn, can create shortages in stockpiles. Savings become worthless, affecting consumers’ bottom lines. And because people aren’t depositing their money, financial institutions and lenders may go out of business. Tax revenues also fall, meaning governments can’t keep up with providing basic services. Printing more money becomes the only option, making the hyperinflation even worse. One of the more devastating and prolonged episodes of hyperinflation occurred in the former Yugoslavia in the 1990s. On the verge of national dissolution, the country had already been experiencing inflation at rates that exceeded 75% annually. It was discovered that the leader of the then Serbian province plundered the national treasury by issuing $1.5 billion of loans to cronies. This forced the government to print excessive amounts of money so it could take care of its financial obligations. Hyperinflation quickly enveloped the economy, erasing what was left of the country’s wealth, forcing its people into bartering for goods. The rate of inflation nearly doubled each day until it reached an unfathomable rate of 300 million percent a month. The government quickly took control of production and wages, which led to food shortages. Incomes dropped by more than 50% and production crawled to a stop. Eventually, the government replaced its currency with the German mark which helped to stabilize the economy.